The debut of new series artist Bill Sienkiewicz. Outside the mansion, a ratty red-haired girl works up the courage to approach the school. Inside, Cannonball, Sunspot and Magma practice in the Danger Room as Dani and Illyana observe. Illyana can tell something is troubling Dani, but Dani refuses to tell her about the recurring dreams she's experienced of the Demon Bear since their return from Massachusetts. The doorbell rings and Illyana answers it to find the red-haired girl. She asks to see Professor X, but Illyana tells her he's away, spooking her after Illyana introduces herself. Meanwhile, in space, a being named Warlock is pursued by his powerful father. Back at the mansion, Illyana runs Dani through a Danger Room sequence in which she fights a large bear. That night, as Dani realizes the Demon Bear only killed her parents to get at her, she resolves to stop running and face the creature once and for all. Dani walks into the woods surrounding the school and calls out to the bear. The creature appears, and they do battle, with Dani apparently killing her foe. However, back at the school, Rahne suddenly awakens, sensing pain from Dani through their rapport just as Roberto hears a terrible scream from the woods. 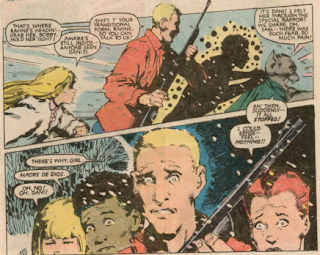 The New Mutants race outside only to find a bloodied Dani unconscious in the snow. Bill Sienkiewicz comes aboard as the new regular artist (penciling and inking) for the book. 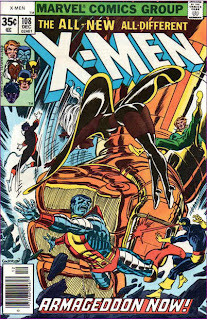 Originally a disciple of Neal Adam's more realistic style (as seen in his fill-in work for X-Men #159), Sienkiewicz unveils a new style with this issue, one that becomes his dominant and most famous style and will continue throughout his run on the series, in which he trades realism for surrealism and the avant garde, stretching the boundaries of traditional page and panel layouts and character design to enhance the story. 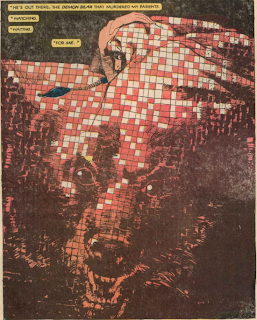 His arrival kicks off the three issue "Demon Bear Saga", generally considered one of New Mutants best and most well-regarded stories, thanks in large part to Sienkiewicz's art. This issue also marks the first appearance (albeit just a cameo) of future New Mutant Warlock, and his villainous father, Magus. A techno-organic being, Warlock was created to take advantage of Sienkiewicz's style, though he will remain a part of the book for almost the remainder of its run. 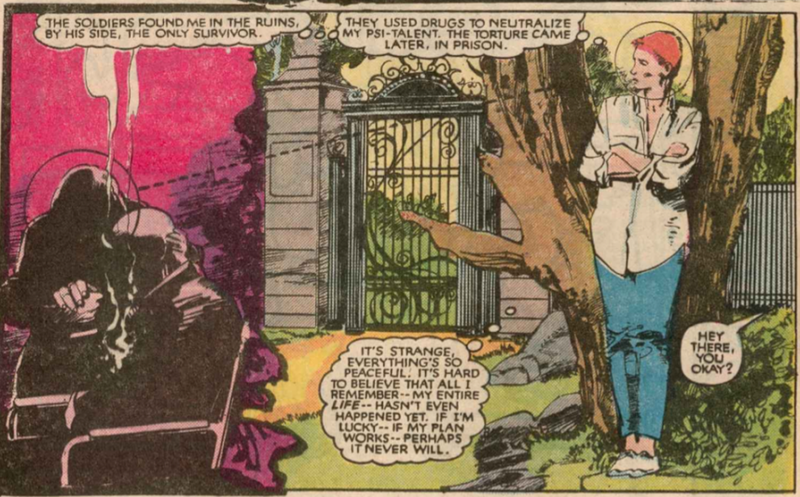 Rachel Summers (though readers at the time have yet to be told that's her last name, and she is never named in this issue), the redheaded telepath who sent Kate Pryde's consciousness back in time during "Days of Future Past", returns, appearing in the present day looking for Professor X. In a further testament to how Claremont is starting to pass plotlines back and forth between his titles, her story will continue in X-Men #184. 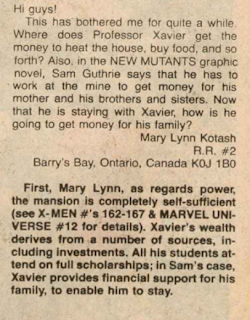 As with X-Men, Ann Nocenti becomes the book's editor as of this issue. 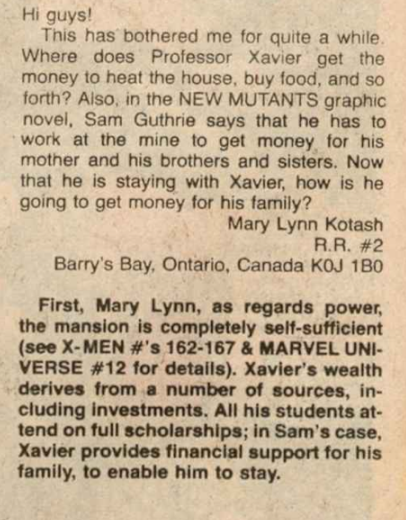 We know from X-Men #183 that Kitty made it back to the school, though Doug Ramsey's fate (the initial reason Kitty, and thus, the New Mutants went to the Massachusetts Academy) is left unstated (though future issues will cover it). Dani muses that perhaps Sam is having the hardest time mastering his power (specifically, learning how to turn while blasting) because he's the oldest of the New Mutants. Dani mentions that Professor X is away in Massachusetts, though it's never established what he's doing there. Illyana, answering the door, shoos Lockheed, reminding him he's supposed to stay hidden from the general public. 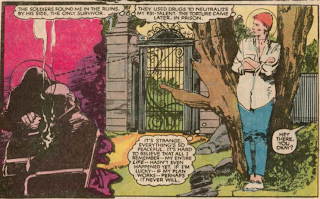 Rachel, upon being greeted by a teenaged Illyana and told Professor X is away, freaks out and leaves the mansion, wondering how Illyana could be a teenager now when she was that age in Rachel's time. It's not the last time we'll see her crying/freaking out. 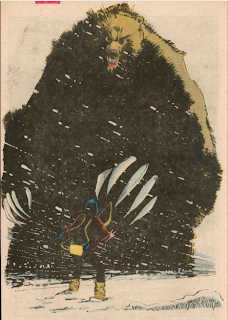 The Demon Bear, who last appeared in the preceding issue as an almost fluffy cloud-like vision taunting Dani, gets a menacing new look thanks to Sienkiewicz. Both oddly and humorously, Sam races into the woods after Dani carrying a shotgun. Dani is now also referring to Sam as being "pretty near invulnerable" while blasting. As I've said often before, I largely lack the vocabulary to accurately and effective describe why art does or doesn't work for me, something I'm likely to continue to struggle with throughout Sienkiewicz's run. That said, he starts this first issue of his run off with a bang, capturing the terror the Demon Bear instills in Dani in the opening splash page. Greg Burgas did a great analysis of the page for Comics Should Be Good (he also has an overview of the entire Sienkiewicz run here, though there are decades-old spoilers therein). Sam's crush on Amara has become pretty obvious, with both Roberto and Dani commenting on it. We learn how Professor X was killed in the "Days of Future Past" timeline, via a sequence I've always found particularly effective. As Rachel flashes back to the army attacking Xavier's mansion in her future, Sienkiewicz depicts a still-crippled Xavier trying to reason with the army, literally pulling himself into a standing position via the drapes, before being blown away. A response to a letter in this issue's letter column says that Xavier funds his school via investments, a far cry from the days of him begging Angel for a loan to repair the school. It's also revealed that many of the students, including Sam, attend via scholarship, with Xavier helping the Guthrie family with the wages lost by Sam's absence while attending school. "It was sort of a case where with Bob McLeod, it was good. With Sal Buscema, it was good. With Bill Sienkiewicz came aboard, it was suddenly like, 'Holy Toledo, this is CRAZY!' Talk about synergy of artist and writer! Bill was in a period of evolution, just like we all were. He suddenly discovered Ralph Steadman and just went with it. I think from Bill's point of view, he'd given birth to this whole crew of Neal Adams clones and he was just at the point where he wanted to try something different. With [editor] Ann Nocenti and this book, he had the right venue. We had sort of been moseying along being very normal and very middle of the road and so were primed to be crazy. We were dealing with teenagers who were full of volatility, big emotions, big crises, none of which had anything to do with saving the world. I'm just talking slumber parties, living at the mansion and making friends." This is arguably the most significant issue of the series since the first. 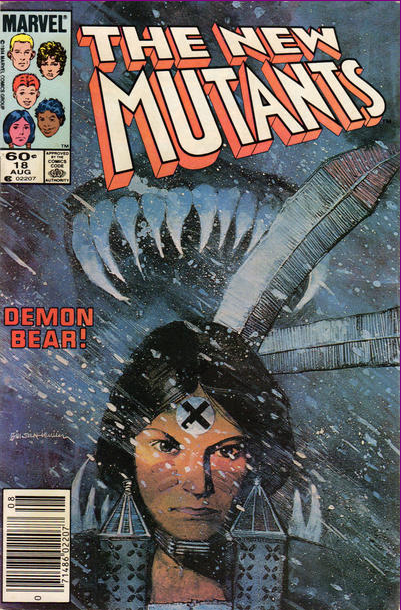 Though the story itself isn't unlike those that came before it (in fact, it spends almost as much time on character development and setup as it does addressing the Demon Bear), the issue marks the beginning of one of the series' most memorable and well regarded story arcs, while also featuring a brief glimpse of future New Mutant Warlock and bringing Rachel, a character who will have a significant impact on the course of the X-Men, from "Days of Future Past" into the present day. But most importantly, it features the debut of new series artist Bill Sienkiewicz. The significance of this cannot be overstated. His surreal and groundbreaking work is critically acclaimed, though certainly divisive amongst fans. When I first encountered these issues as a kid, I was very turned off by what I felt was impenetrable, muddy art that made it difficult to follow and understand the story. As I got older and more experienced in reading comics and more comfortable with non-traditional art, I gained a greater appreciation for his work on this series, and to this day it remains some of my favorite art. Every time I re-read these issues, I notice something new or read a sequence differently. While few artists will come to embrace the level of surrealism and penchant for the avant garde he brings to his work, he will be greatly influential on a score of up-and-coming artists (and, due to the popularity of the X-Men books, New Mutants put a lot of eye balls on Sienkiewicz's new style), and his influence, including the propensity to break established norms, is evident in much modern comic book art. Love it or hate it, as Claremont said, his work elicits a reaction, and it is his work that is responsible for putting New Mutants on the map. Sienkiewicz got people talking about the series significantly for the first time and his arrival marks a clear demarcation point in the history of the title. Simply put, there is New Mutants pre-Bill Sienkiewicz, and there is New Mutants post-Sienkiewicz. I've never read New Mutants, but I have to admit the Sienkiewicz art really makes me want to pick up some of these issues. With all the new story lines is this a decent starting point? Speaking of fantastic art, Jerome Opena on the current Avengers title has been amazing. He and Jonathan Hickman are bringing a "European comic" flavor to the series that's been great. This article made me think of it because it's a pretty big break with what was being done in the last volume of the title (and also way better). Sienkiewicz's problem was that he had no sense of when to stop pushing the envelope. Some of his early stuff on New Mutants is breathtaking but toward the end it was largely incomprehensible. I picked up his run on Daredevil a while back as part of a bulk purchase and literally couldn't get through it because the art was so...shall we say non-standard. And Warlock. Dear sweet mentally challenged Warlock who drove me crazy by referring to himself as "self" and everyone around him "self-friend". He couldn't die fast enough. I'm going to agree with Anonymous. The Sienkiewicz we see here is fine. He's experimenting, but his people still look like people and the pages are clear and easy to follow. But as Anonymous says, he didn't know when to stop. Eventually we will see Xavier with huge bushy eyebrows that grow off of his head, defying gravity, and Magneto with a Wolverine hairdo that out-Wolverines Wolverine. And don't get me started on how grotesquely exaggerated Legion looks! I understand how people can like Sienkiewicz's insane, experimental style. I just don't like it myself. If his whole run had been drawn like this issue, it'd be fine. I love the Demon Bear as presented here! But the art just keeps getting weirder and weirder, and further from anything even resembling normal, and it detracts from my enjoyment of the stories. Also, as I think about it now, another reason I dislike Sienkiewicz in this run is that it doesn't "match" Uncanny. Romita's art is very traditional and grounded, while Sienkiewicz is experimental and insane. Previously, you had Smith and then Romita on Uncanny while McLeod and then Buscema were on New Mutants. I think it's universally agreed that Smith's art was more attractive than Buscema's, but they were both traditional, clean styles. The difference between Uncanny and New Mutants at this point is night and day. This is my own opinion, and it may be unpopular, but I feel strongly that a line of books should have a unified house art style. Artists should be assigned to the titles under a particular line only if their styles are compatibly similar. It makes the experience of reading the entire line much more enjoyable for me. I had a similar problem in the 90's when you had Andy Kubert on X-Men and Joe Madureira on Uncanny. The difference being I liked both of them quite a bit -- but it was still jarring going between two comics about the same characters with such totally different styles -- especially during crossovers where they continued one another's stories directly! I agree with Anonymous about Warlock too, but I'll elaborate as his appearances go on. "This issue also marks the first appearance (albeit just a cameo) of future New Mutant Warlock, and his villainous father, Magus"
Not to be confused with Adam Warlock and his villainous future self, the Magus. I've never quite understood why Claremont did this. I get the connotation between the terms "warlock" and "magus", but didn't he find it odd he was naming two related characters after two other related characters from a very highly-regarded run of comics? Was this supposed to be a tribute to Jim Starlin or something? Or just a coincidence? "We learn how Professor X was killed in the "Days of Future Past" timeline..."
Wow, for some reason I was sure Byrne had drawn this scene in DoFP, but he didn't. I think maybe I was thinking of Romita's illustration of it in Uncanny sometime in the near future. Whatever the reason, the version I visualized in my head was most defintely not in Sienkiewicz's style. Also... "I must use my telepathic powers to try to reach their commander!" ...... then he starts yelling instead? I feel like that last balloon should've been a telepathic thought balloon, not a speech balloon. I have to point out that it's "Sienkiewicz" and not "Seinkiewicz". Jumbled in parts though the issue may be — the Warlock interlude, the unexplained Rachel stuff, the narration by Dani even on pages that aren't depicting what she's thinking about — it's more interesting than pretty much the entire series to date put together. Claremont stepped up his game for sure. The letters page is 10 issues behind. One letter says of Sam, "I was afraid you were going to play on his inability to maneuver for a long, long time." While that relief was premature, as evidenced by this very issue, it does seem like Sam was making progress a while back that got ignored. Sienkiewicz's art is such fresh air, if fresh air were dark and moody and claustrophobic. Even if his style itself weren't flat-out fascinating, the variation in panel layout alone instantly modernizes the look in contrast to Buscema's pedestrian grids. I do appreciate what Matt and Anonymous said, however; Sienkiewicz pushed the envelope so far it became an origami duck, and it eventually at times was ridiculous in its exaggeration. Here in the early days of his edging beyond photorealism with judicious abstraction, Sienkiewicz does what I often wished Alex Ross was better at allowing himself to do — using his ability to be spot-on representational and fancying it up just enough to depict the fantastic as if it was believably unbelievable as opposed to making what should be fantastic a little too mundane. That link to Greg Burgas writing about the splash page was appreciated. I especially liked his notice of how the white of Dani's eye formed a crescent moon, which whether intentional or happy accident is genius. I started collecting X-books with New Mutants #35, and worked my way backwards at my local comic shop, one issue at a time. I can't explain the thrill the Sienkiewicz issues gave me, hyper-realism mixed with splattery, crazy imagination. Claremont's words plus Sienkiewicz' lines made Dani, Rahne, Sam, and Bobby into real people I gave a damn about. When I think about comic artists/runs that shook my idea of what comics could be, I think of these issues along with Frank Miller on Dark Knight Returns, and Arthur Adams on New Mutants Special Edition/X-Men Annual #9, and Walt Simonson on Thor. Love your site, I'm here everyday! Bill Sienkiewicz is my favorite artist. He took a so-so comic and turned it into a visual tour-de-force unlike anything ever seen in mainstream comics. I loved how he kept pushing the envelope, and New Mutants is a great place to track his development as an artist. I can't top what Greg Burgas wrote, but I'll talk a little about the art; Sienkiewicz pushed abstraction into super-hero comics while adding enough realism to keep things semi-grounded. Abstract art isn't my thing, but tie distortion and surrealism to a recognizable scene, character, or situation and it can enhance the emotional content of the work. Look at the sequence drawn from Rachel's memories (p. 2-5): Rachel is drawn semi-realistically throughout. She grounds the action, and we see the horrors as happening to a recognizable figure. Page 2, panel 1: the mansion is drawn simply, at a distance, not dissimilar than any other artist's establishing shot. Panel 2 shows the explosion that destroys the mansion. The explosion extends beyond the panel borders, and the building becomes hideously twisted. The black shapes representing falling debris in panel 3 denote chaos, while the lamp in the foreground pierces the panel border. Rachel goes from semi-realistic to angelic ( doe-eyed, looking up for guidance, brightly-lit) to scared in a 3 panel sequence. The black shapes surround her as she reaches for Xavier in the bottom half of page 3, the professor's features hidden in shadow. 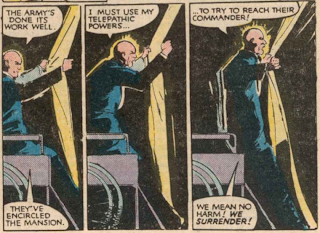 The next panel shows Xavier' face lit by the light coming from the window, yet Sienkiewicz added lines that serve to keep his features partly obscured. The panel reminds me of the fuzziness of memory. The barrels of the unseen destroyers' guns dominate the next panel, pointed at the distant burning mansion. We then see the sequence in which Xavier rises from his wheelchair. 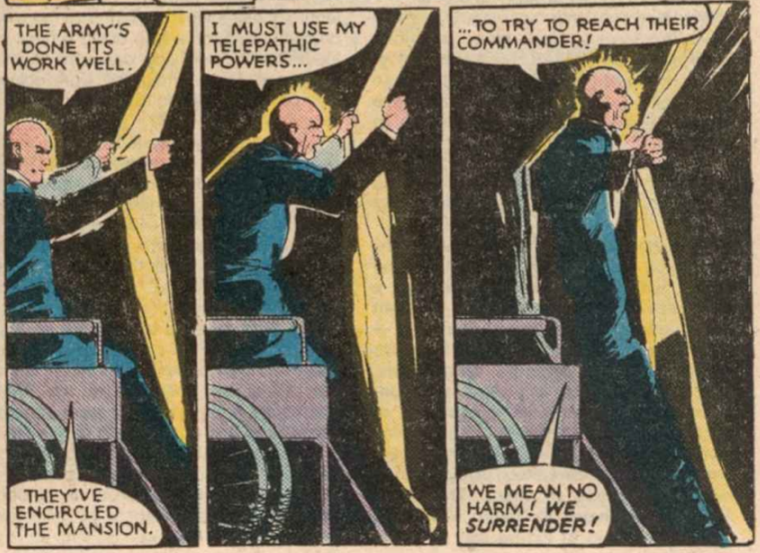 As he rises, his facial expression changes, the curtains are pulled taut, and Sienkiewicz adds motion lines to indicate the force of Xavier's movements. The tension of the scene rises with the professor. The top half of pages 4 and 5 depict Xavier getting shot. The force of the shot knocks him back in his chair (indicating his helplessness). Sienkiewicz drew a few sketchy wheels in front of the wheelchair, indicating how it rolled back. The wound is a mass of shadow and ink splatter, similar to inky masses around Xavier's face and tie indicating motion. Making the wound more abstract makes it jarring, and is similar to the inky shapes that indicated debris on the previous pages. 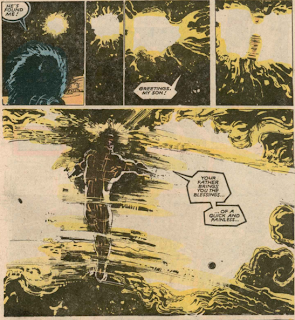 Sienkiewicz uses negative space effectively, stripping the image to Xavier and a giant BLAM to maximize impact. If only Claremonthadn't givenXavier a word balloon that gets cut off in mid sentence; a silent Xavier would have worked better. The flashback ends with a panel of Rachel cradling Xavier, both figures practically silhouettes, with the wound smoking. The sequence is nightmarish due to the choices Sienkiewicz made. McCloud, Buscema, or even Byrne would have stuck to a literal interpretation of events, which would not have been as disturbing. Forgoing line drawings of the mansion's destruction, Sienkiewicz's version is much more visceral. I'm probably over thinking things, but I thought I'd give it a shot. I could go through this issue scene by scene. Dani's encounter with the demon bear is astounding. I'll try to keep the gushing down. @Jason Garrett: I started with issue 35, too. The concept laid out on the cover was irresistible. I first read this issue when I was about 14, and the art was a huge turn off for me. The change was just so jarring, and everything just wasn't "comic booky" enough for me back then. I remember being annoyed that I had to plow through roughly 15 issues of this to get back to the normal stuff. After reading back through these issues recently I appreciate them far more now than I did then. I don't think my teenaged mind knew what to make of the art since it was outside the norm. The opposite occurs when I read some of the mid 90s comics that I thought looked good at the time. If I pick up those issues nowadays I stop to wonder why I liked it so much (I'm looking at you, X-Force #43). It probably had something to do with "the style at the time" and being part of what was common. Claremont seems noticeably, and thankfully in this case, restrained in his use of text compared to normal. I don't find him to be that verbose normally, but this issue benefits from the art doing the heavy lifting in many places. The fight scene between Dani and the Demon Bear contains remarkably little dialogue or narration which makes it work perfectly. The end of this trilogy leaves another mystery as to the force behind it all. Does anyone remember if this ever gets resolved? I know there was an arc in X-Force around issue 99 about the Demon Bear but I can't remember what all went on... perhaps a blessing but it got me curious. Also, for anyone who's been wanting to get the New Mutants Classics TPB (Volume 3) for these upcoming issues, hopefully I'll save you some time/money and point you to instocktrades.com. When I was looking a few months back, they were the cheapest I found for a new book (Amazon 3rd party was around 2.5 times more for comparison). @Jeff: With all the new story lines is this a decent starting point? I think so. It's hard to say with certainty, but I think someone could pick up this issue and get enough of an idea of what's come before to not get lost. Claremont definitely does his best to keep an eye out for new readers (something that leads to some the tics for which he's often criticized). Everything you need to know to enjoy this story is there in this issue, and it isn't like you're totally unfamiliar with the concept of mutants, Xavier's school, etc. @Anonymous: Some of his early stuff on New Mutants is breathtaking but toward the end it was largely incomprehensible. I don't remember having an issue with it even towards the end of his New Mutants run, but I also haven't returned to those issues more than once or very recently (whereas I've read the front half of his run several times). I will say that I've never been able to get into Elektra: Assassin in part because Sienkiewicz's art is SO off the wall there. @Matt: it was still jarring going between two comics about the same characters with such totally different styles -- especially during crossovers where they continued one another's stories directly! I don't mind a difference in style across the line if the books within it aren't interacting directly (at least not regularly) or feature different casts of characters. But there definitely was a jarring sensation with stuff like Kubert/Madureira because they were handing plotlines and characters back and forth month to month such that the two books were really just one title shipping bi-weekly. Was this supposed to be a tribute to Jim Starlin or something? Or just a coincidence? Good question. If I had to guess, I'd say coincidence. I don't recall ever hearing much about Claremont being close to Starlin or specifically citing his work as an influence/favorite. He obviously could have been very aware of it, but I could also see him never really making the connection (heck, it took me awhile to make the connection when I was younger, even though I was familiar with both, probably because I was more familiar with the New Mutants pair than the Starlin one). Then again, for all I know, it could be a tribute to Starlin. I feel like that last balloon should've been a telepathic thought balloon, not a speech balloon. Definitely. Whether that's a letterer error (I think they're the ones who draw in the speech and thought bubbles) or a failing of Claremont not making it clear is hard to say. @Blam: I have to point out that it's "Sienkiewicz" and not "Seinkiewicz". The letters page is 10 issues behind. Yeah, they went a long chunk there without any, but that's the point where I think you might need to just skip over coverage of some issues to get more timely (see also Uncanny, which is nearly ten issues behind as well at this time). @Jason: When I think about comic artists/runs that shook my idea of what comics could be, I think of these issues along with Frank Miller on Dark Knight Returns, and Arthur Adams on New Mutants Special Edition/X-Men Annual #9, and Walt Simonson on Thor. I love the Asgardian two parter in the New Mutants/X-Men annuals. One of my favorite stories of all time, with just fantastic art. @Mike: Finally, the good stuff! Heh. Not that I don't enjoy the early issues of the series on some levels, but I'd be lying if I don't express a similar sentiment when I reach this issue. I'm probably over thinking things, but I thought I'd give it a shot. I could go through this issue scene by scene. I'll try to keep the gushing down. Gush away! I greatly appreciate your analysis of those pages - that's exactly the kind of thing I find myself lacking the ability to do, which makes me appreciate reading it all the more. And I agree that the Dani/Demon Bear confrontation is an absolutely fantastic series of pages. @Jay: I remember being annoyed that I had to plow through roughly 15 issues of this to get back to the normal stuff. That was the exact same sentiment I had back in the day, when I originally read these issues. The opposite occurs when I read some of the mid 90s comics that I thought looked good at the time. Ditto again. I loved Liefeld's art back in the day, and was simply oblivious of his inability to draw feet, poor staging and lack of coherent action. The end of this trilogy leaves another mystery as to the force behind it all. Does anyone remember if this ever gets resolved? I don't recall offhand, though I've only read that late run of X-Force only once, so I could easily be forgetting something. I happened to run into one of Sienkiewicz' uncolored pages from this article... cool to see the difference they muddy paper made to his art. 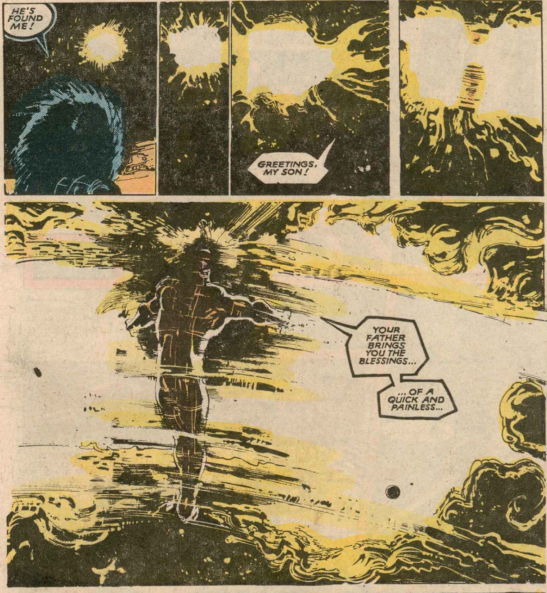 @Jason: I happened to run into one of Sienkiewicz' uncolored pages from this article... cool to see the difference they muddy paper made to his art. Wow, that's really cool. Thanks for sharing it! I'm actually really impressed with how clean it looks. It almost makes me wish we'd gotten an Essential New Mutants at some point (though the paper quality there may have had a similar effect as the original issues...). That link is great, Jason. I always love seeing original art. Super-clean lines are as fascinating as splattered ink and Wite-Out (or, as here, both). It was rare back then for letters to be pasted up on completed, inked art. Even when one artist both penciled and inked a story, the board often had to go through the letterer in between those stages, probably due to some combo of assembly-line editorial fiat and the presumption that changes might need to be made to the pencils during the inking stage, especially when working plot-first/Marvel-style, after lettering in the script. Until computer-aided lettering became the norm, you usually only found pasted-up hand lettering on painted art — which of course was itself rare. Nowadays so much is done digitally there may not be much if any original art on a paper or board at all. I love BS. Ages ago, I was forced to sell a chunk of my comic collection, and the BS run of this title was one of the few arcs I refused to part with. Don't get me wrong, UXM was terrific, but the NM dealt with some *dark* topics considering it was seen as the "teen" book. In it's own way, it underscored that adolescent belief that everything in life was high drama & life/death. I loved it (and still ddo.